From time to time we enjoy a dinner of just vegetables and a dip. These are times when we sit and talk, visit with friends — casual slow times. For these occasions to feel like dinner rather than a snack, the dip needs to be substantial, carrying some protein. Hummus qualifies. 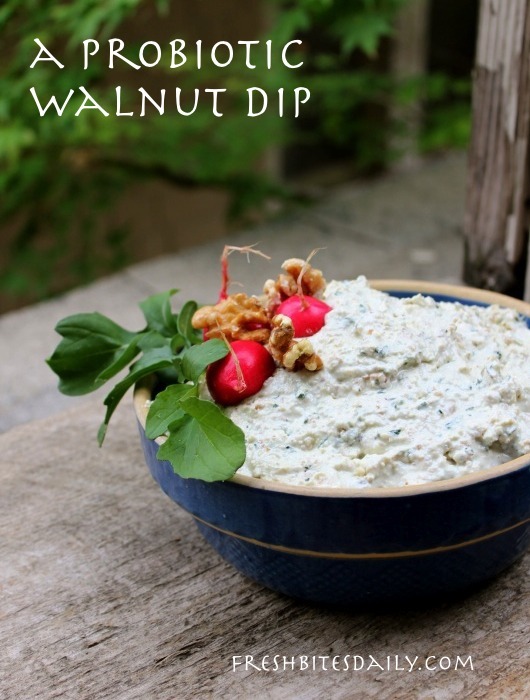 So does this walnut dip. It is rather broadly adapted from a recipe at Food and Wine (here). The flavors are bright and sharp. 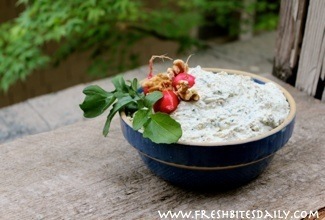 Somehow it makes me think of spring although this dip is delicious any time of the year. If you follow this recipe, the dip will be rather thick. At this thickness it also makes a good sandwich spread or an addition to a lavash roll-up. What a memorable lunch that would make! Try a generous dollop on your baked potato or beside a piece of grilled fish. Thin down the dip with cream or kefir and now you have a dressing. Drizzle it over a salad of simple greens for a gourmet experience. Toss it into some warm cooked grains like quinoa or farro. Use it as the dressing on a chickpea and barley salad laced with slivered green onions and sliced radishes. I could go on and on but my mouth is already watering. You get the idea! The kefir cheese (labneh) can be purchased at Middle Eastern groceries or you can make your own as I do (by allowing the whey to separate from the kefir curds and using the curds as a cheese). Besides being a tasty ingredient, kefir provides a substantial amount of probiotic to this recipe. Did I just give you an excuse to make up this recipe asap? Good! If kefir cheese is not available to you, use a soft goat cheese. Be certain to toast the walnuts. Yes, it is a bit more work, but the difference in flavor is what makes this dip work so well. Place the toasted and cooled walnuts into the food processor and pulse a few times. You want the walnuts to still be chunky, not a paste. Remove the walnuts from the food processor and set them aside. Add the kefir cheese and cream cheese to the food processor and whiz it for 30 seconds or so. Slowly add the olive oil. Check for texture. Add cream or kefir to thin down the dip if necessary. Add the walnuts, garlic, and arugula to the dip and pulse a few times to just mix all the ingredients. Salt and pepper the dip. Taste and make adjustments. Consider what you will be using with the dip. If you are serving something like salted chips, take it easy on the salt you add to the dip. Scoop the dip out into a nice serving bowl and get ready for some good times.